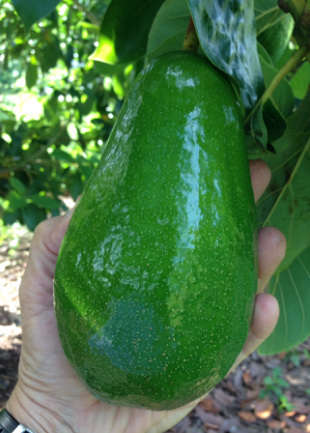 Berta Rodriguez avocado is in the West Indies Avocado Collection at Fairchild Tropicals Gardens Williams Farm. Read about the Vaughn-Jordan Project. I was advised this avocado is from Nicaragua. In January 24,2012 (new moon) I got some bud-wood and top-worked a tree. Seems like both grafts took. I hope to taste this fruit in a couple of years. 4/28/12: Two out of two grafts took and are growing with force. So unless something dramatic happens this will be a huge tree this time next year, hopefully with a few fruit. January 19 2013: The Berta Rodriguez is doing great. I even prune it at the end of the summer. I see flowers buds emerging so It would not surprise me to see fruit this year. See picture for January 2013. March 22, 2013: This tree is 70% done with flowering and it is setting a good amount of fruit for a first year top worked tree. Was not what I hoped for as far as possible salt resistant but let's see if the taste is worth growing it. May 18, 2013: The tree set 4-5 fruit but I don't see them any more, probably drop them. December 31, 2013. The tree is huge. Looks like it could flower within days. February 5, 2014: The tree is in full bloom. Seems to have the male flowers open early and stay open until 1-3 PM and the females open around 3 pm. February 19, 2014: The tree continues in full bloom, I'm beginning to see BB size fruit. It did so last year but did not grow. June 18, 2017: The fruit is large some over 20 oz. Now the fruit I have growing on my tree does not looks exactly like the picture I took about 3 years ago at Williams Farm or the picture taken by Epifanio on July 9, 2012. Seems to have a longer neck. I wonder if cultural practices make a difference. The way the stem connects to the fruit is identical, very strong connection. Time has come to test the fruit for maturity. Certainly is has a good size but I don't know the ultimate size of this fruit so we start today testing. Good looking fruit, very bright and shinny. See today's picture. July 29, 2014: Seems this will be an August fruit. The fruits picked have not been maturing properly. It will also be a big fruit. in the 25-30+ oz. range. I have picked a lot of fruit and has a lot more probably total of 100 lbs. The tree is mot dropping any fruit. Fruit has a shinny beautiful color. August 14, 2014: I saw 3 fruit in the ground today. Could be an indication the fruit is ready. I picked a few fruit and a couple had loose seed in the cavity. Seems like this will be a large August fruit in the 30-40oz. August 30, 2014: For some reason I did not get any of this fruit to ripen properly. January 31, 2015: Inflorescence are beginning to expand. Should have open flowers in a few days. March 3, 2015: Seem like the tree is just passed full bloom. Have not seen any fruit set. August 28, 2015: Nice looking fruit but is does not ripen well in our area. I will not follow this tree anymore and will probably cut down the ones I have. October 2018: The fruit in this trees is very large and continues not to ripen well. Hard to understand but that's the way it is. I suspect this cultivar came from a high elevation. I have not gotten rid of the trees because they are a B flower and as it turns out is a good pollinator of A flower trees.